One of those first jazz guitar albums that I loved so much was by Remo Palmier. 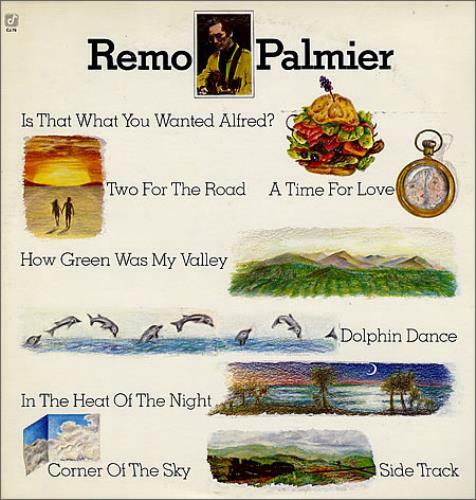 It was his self-titled 1979 Concord Jazz release "Remo Palmier." The swinging was easy and it showcased an endless string of wonderful and mellow jazz guitar sounds. The playing was so pretty and melodic. It blew me away. So I was thrilled to finally find a few clips of it on Youtube. The album has been out of print for ages and is not available on CD AFAIK. Earlier I posted a great track from it in an entry here. But I am happy to be able to post some new clips of that fine album here. Listen to this! Remo's recorded output as a leader is very limited. He was a studio musician with CBS for over 27 years and was guitarist with the Arthur Godfrey (radio) Show in the 1960s and 1970s. In 1972 Palmier made a modest return to jazz freelancing for a period with his own quartet in various New York clubs. When he recorded "Remo Palmier" in 1978, he had not been recording as a jazz guitarist for over 30 years! Remo Palmieri hit the New York jazz scene as a teenager in the 1940s and almost immediately found himself playing with some the premier jazz artists of the time. He teamed up first with Coleman Hawkins and then Dizzy Gillespie and Charlie Parker. His talents as a jazz guitarist and musician were in great demand and during this same period he recorded with Teddy Wilson. 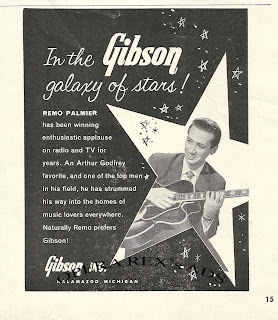 In 1945 he recorded with Gillespie and Parker and Red Norvo and was awarded a "new star" award from Esquire, Palmieri was one of the first guitarists to extend the ideas of Charlie Christian, but he chose to live the life of a studio musician. In the late 1940s he began performing with Arthur Godfrey on CBS, and taught Godfrey to play the ukulele. He was with CBS and for more than 27 years as he pursued a very successful career as a studio musician. If you listened to the Arthur Godfrey radio show on CBS in the 1960s and early 1970s you heard Remo Palmieri's guitar in the background. He changed his name legally in 1952, omitting the "i" at the end, to Palmier to not be associated with the already famous, Eddie Palmieri. 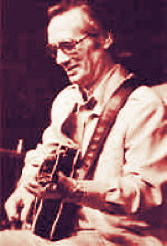 In 1972 Remo Palmier left the studio when the Godfrey show was canceled and he returned to playing in local nightspots in New York. Then in 1977 his friend Herb Ellis convinced Carl Jefferson to invite Remo Palmier to the Concord Jazz Festival in Concord, California. At that festival Palmier and Ellis teamed up for some duet playing and later that year they made the recording Windflower. That recording marked the end of a 30 plus year hiatus from recording for this talented jazz guitarist. Then in 1979 Concord Jazz produced the first recording on which Remo Palmier was billed as the leader. Remo was largely self taught. He first started to play the guitar at the age of eleven. He became interested in jazz when he heard some Tommy Dorsey recordings in 1938. He then started to listen to recordings by Django Reinhardt and Charlie Christian. In 1942 he joined painist Nat Jaffe's trio and soon gained a reputation as one of the most developed East Coast jazz guitarists. 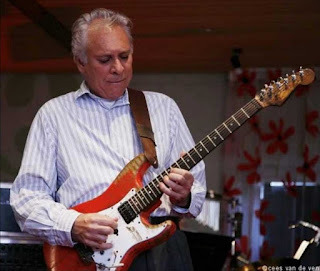 After recording "Windflower" with Herb Ellis in 1977 and "Remo Palmier" in 1978, he continued to perform regularly and work as a studio musician. He also taught privately. Remo died in 2002. Here's a final track from "Remo Palmier" for you to check out. A wonderful player. Here's a guitarist most of you have most likely never heard of. Heck, even over here he is not very well known. Nevertheless, Eef Albers is one of the most prominent musicians in the Netherlands. He has made 4 solo CDs, but is more notably active as a teacher at the Royal Conservatory in the Hague and as a guest musician. I'd call him a fusion player. Most of his music is in that genre. 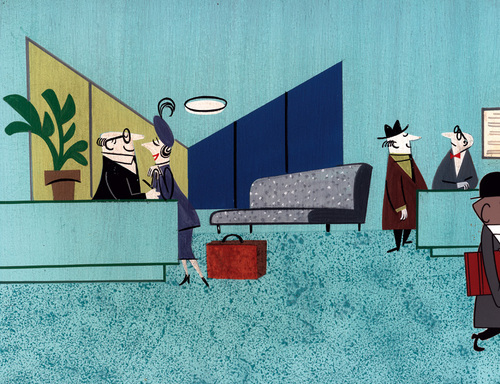 In his work, Albers uses influences from the blues, rock and jazz, as well as classical music. He's not really a traditional jazz guitarist. I've only found a few clips on Youtube that show him in a straight ahead jazz setting. But man, when Eef starts boppin' out on his Strat, he's up there with the best. Check out his solo on "I'll Remember April", which was recorded at some jazz jam a few years ago. The second clip that I really dig is from 1988. 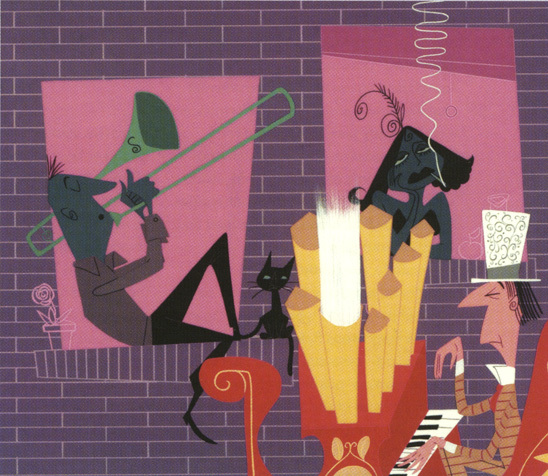 It features Eef in a big band setting. He's playing "Moment's Notice" with the Metropole Orchestra. Amazing! And from the same concert with the Metropole concert in 1988 here's "On a Slow Boat to China." 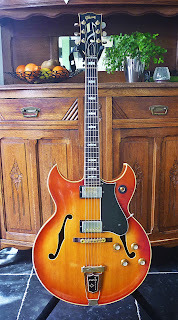 On april 25 I bought my 1963 Gibson Barney Kessel Custom. I had had my eyes on that guitar for a few years - I had played it several times earlier when I was at Charlee Guitars - and after I sold my old Strat, I finally bought it. 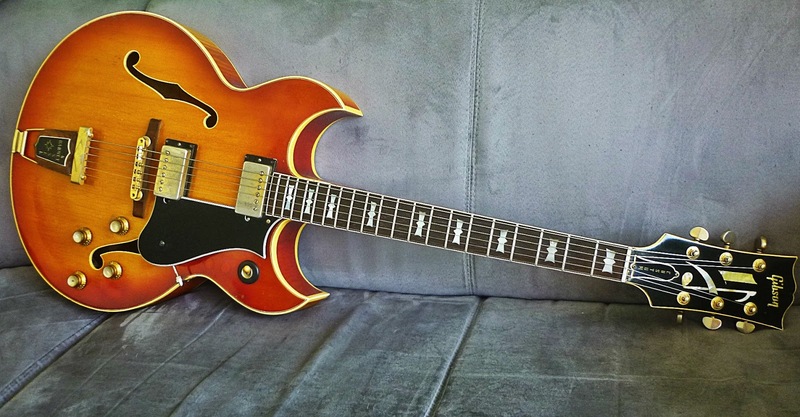 The Barney Kessel is a guitar that has grown on me. I remember that when I first saw one many years ago, the double cutaway design did not not particularly appeal to me. But over the years I started digging' this classic 60s design more and more and I when I finally played one a few years ago I was immediately floored. What a classic and mellow jazz sound. I was feeling the Barn! The Gibson Barney Kessel "Regular" and "Custom" models were made in Kalamazoo, Michigan, between 1961 and 1972 (a few final samples were still shipped in 1973). 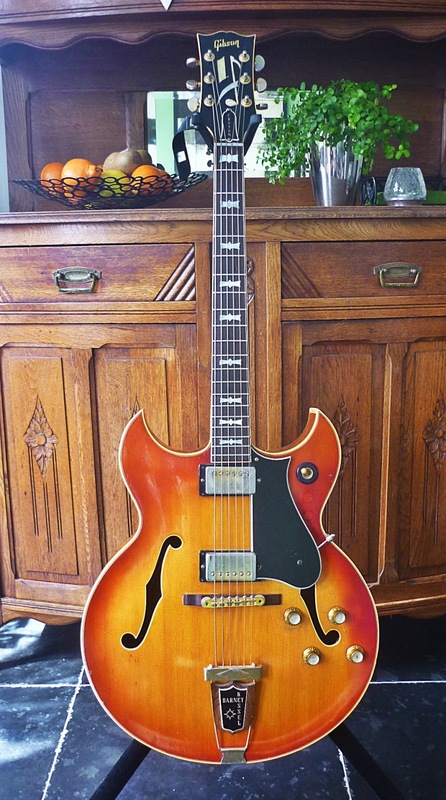 Designed as a high-end artist-signature jazz instrument, the cost of the BK models in 1961 was 560.00 for the Custom and 395.00 for the less-ornate Regular. By 1966, the two models cost 675.00 and 525.00 respectively. 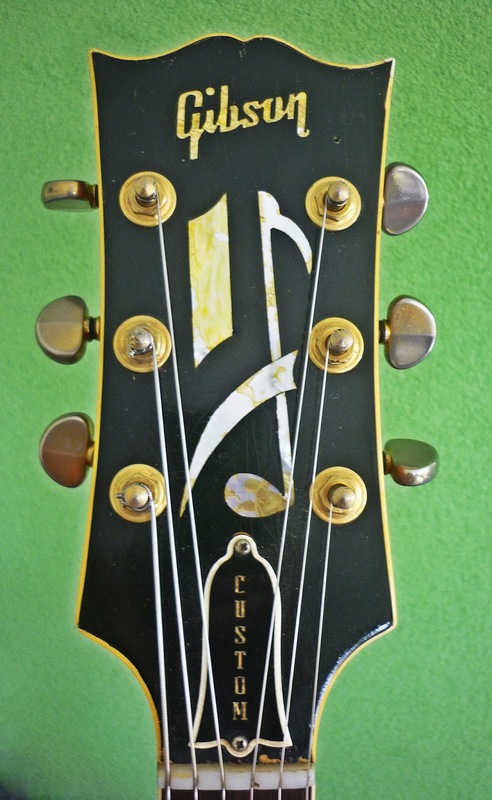 In general, the BK design was characterized by a double florentine cutaway, and a large Super 400-size headstock. Its 17-inch lower bout was L-5-size although a bit thinner at 3 inches. In total, 740 BK Customs were made. Let's have a look at some specifications. The BK Custom has a flamed maple neck; solid Brazilian rosewood fingerboard; arched spruce top; arched tiger flame maple back and sides; bowtie mother of pearl fingerboard inlay and eighth-note peghead inlay; triple bound body, bound neck and soundholes. The gold hardware includes twin Gibson Patent Sticker humbucking pickups and electronics; beveled 5-ply pickguard; 3 way control switch, gold reflector cap knobs, Kluson Super 'waffleback' tuners, adjustable compensated Brazilian rosewood bridge, Barney Kessel engraved nameplate tailpiece. Both models were made in cherry sunburst finishes and were equipped with 2 humbuckers . The "flashy" design of the model is unmistakably 1960s cool. The headstock inlay and the double cutaway reflect the "cartoon modern"style that was hip in the 1950s and 1960s. 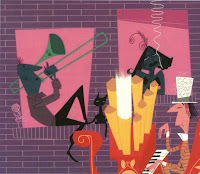 It's the modern art style that is featured in cartoons from that era and that you see on many classic jazz albums covers too. Many people are not aware of this but once you realize the source of the design it becomes so much more "classic." Though the Kessel obviously is a signature model I am not sure to what extent Barney was really involved in designing this guitar. Some argue the model had been designed already and Barney was only asked to endorse it after that fact. Though a few photo's - and ads - exist in which he is holding one, he seemed to prefer playing his trusted ES 350 throughout his career. Maybe the unusual design was a bit too flashy for him in the end. 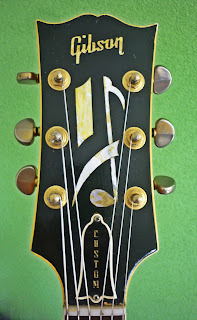 Barney had a strained relationship with Gibson anyway, he has been known to tape off the Gibon logo on the headstock of his ES 350 on several occasions. He did own a few BK signature models though. I read somewhere that his sons sold these after his death. 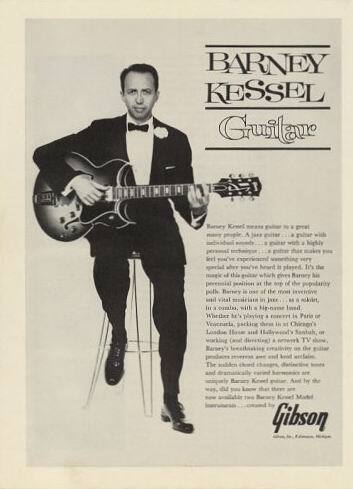 The Barney Kessel was never re-issued by Gibson. Still, the vintage Kessels out there are clearly gaining recognition among jazz players and are moving up in price every year. They are not cheap anymore. But ... they are fine vintage instruments. Did you know that the BK was as expensive as a Byrdland in the 1960s and was actually more expensive than a Gibson Tal Farlow at the time? Quality wise the Barney Kessel has always been up there with some of the greatest archtops Gibson ever built. The most highly prized models (and most valuable) - it can be argued - are the 1961 to 1964 models which most often have a wide-flat neck profile, PAF pickups (or late PAF's with Patent Number stickers), laminated spruce tops, and the long neck heel. Jim, who has the biggest collection of BKs in the world, prefers the mellow sounds of the early spruce BK Customs. Check out his BK pages here. So what does it sound like? Unfortunately, most BK demo clips on Youtube feature rock players having a go at some faux jazz. So I asked some of my friends to do a clip and added a few myself for a better picture. Here's my 1963 BK Custom in action on Kenny Burrell's "Midnight Blue." 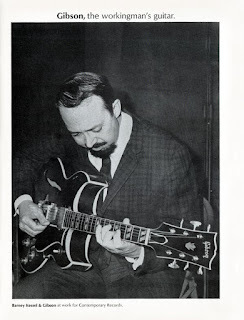 And then there's my other Facebook friend Michael Aadal from Norway playing "The Days of Wine and Roses" on his 1961 BK Regular. He's barnin' it up!